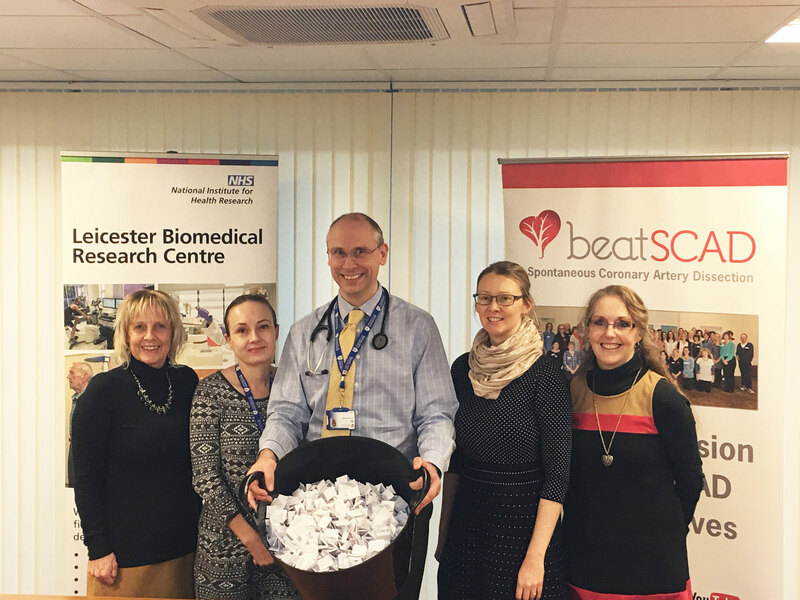 In January 2018, a donation of £3,000 was awarded following the Beat SCAD Prize Draw that ran between September and November 2017. These funds were used to purchase and distribute blood sample tubes to SCAD patients who were registered for the research but had not participated in any research assessments. SCAD patients took the blood tubes to their GP or local hospital for samples to be taken and shipped to Leicester. Almost 400 patient samples plus a further 50 samples from relatives were returned, which was a fantastic return rate and was hugely appreciated by the research team. The publication of the first SCAD genetics paper in the prestigious Journal of the American College of Cardiology (JACC) is imminent and the funding support of Beat SCAD is acknowledged in the manuscript. The blood samples are now undergoing gene sequencing and will soon provide a valuable dataset for the research team to investigate, including looking for known genes for connective tissue disorders. The blood samples are also enabling important laboratory work to be conducted which aims to investigate some of the underlying ‘why’ questions about SCAD. Samples from SCAD patients and healthy volunteers are being used for a proteomics study in which the structure and function of proteins are being analysed. The expression of proteins by cells and tissues can change in relation to disease so this study is looking for any patterns that may be linked to SCAD. 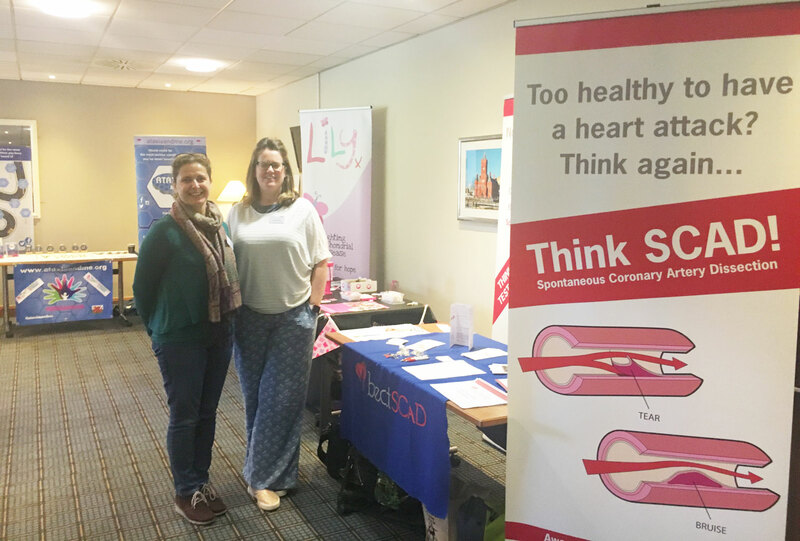 On Thursday 18 October, Beat SCAD Trustees Sarah Coombes and Harriet Mulvaney attended the Rare Disease Patients’ Network in Wales event in sunny Cardiff. This was the fourth such annual event and the first one Beat SCAD had attended. The day was organised and hosted by Genetic Alliance UK (the national charity of 200 patient organisations supporting those affected by genetic conditions and the umbrella body for Rare Disease UK, the national campaign for people with rare diseases and all those who support them) and Wales Gene Park. It brought together many patients, all of whom had a rare disease, their carers and families, healthcare practitioners and other interested parties, to enable networking, sharing of stories, listening to updates on research projects and progress on the Welsh Implementation Plan for Rare Diseases. There was a steady of flow of visitors – patients and their families, healthcare practitioners, researchers, representatives from other charities and organisations. It was a fantastic feeling to be sharing our stories, the power of patient-led/inspired research and the amazing work that is going on in research programmes. We sensed a genuine interest in our condition. There was also the opportunity to attend some of the organised speaking slots throughout the day. Hearing stories from those affected by a rare disease was very moving, and it was a real honour to talk to them when opportunities arose. Whilst all our experiences were different, there were lots of issues and challenges that were shared: including: difficulty and/or delay in getting a diagnosis, limited information about the condition finding the right person to treat your condition, constantly self-advocating and retelling your story in order to get access to the right treatment, plus dealing with the challenges a rare disease throws at you in addition to ‘just life’. Sarah was able to attend a session giving an update on the SIGNAL Project (Studying the Implementation of GeNomics in wALes) – click here to read her report. Harriet heard an update from the Senior Policy Manager at the Welsh Government, responsible for progressing the Welsh Implementation Plan for Rare Diseases, Caroline Lewis. This is a five-year plan, first published in February 2015.
set out how feedback from patients contributes to rare disease treatment and work. In summary, some progress has been made in improving the care of people with rare diseases in Wales, but more still needs to be done. Continued exposure and the raising awareness of the Rare Disease Implementation Plan and the Implementation Group with senior management within health boards continues to bring positive returns, however there is ample room to build on this. Click here to read more about the progress being made in Wales in the latest Annual Report (2017). Yet again, the day provided numerous opportunities to reflect on the collective power of our individual stories.